And we know that. This is why, after receiving a lot of requests from our beloved users, we are now proud to present you with an instant payment script developed entirely for Ethereum lovers. Ethereum is Secure, Fast and Reliable. If you didn’t know, Ethereum is the leading cryptocurrency after Bitcoin and is said to triumph Bitcoin in the upcoming years. It has already risen to all-time high in December and we thought this is the perfect time to introduce to you this platform for your network marketing or business. 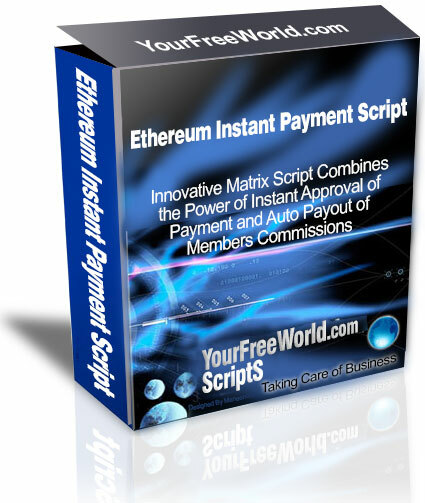 We already had a great response from our Bitcoin Instant Payment Script and now we have come up with the similar script but with Ethereum as the main source of payment. With Ether API, the transactions are as secure as ever and the script gives you the flexibility to pay and receive commissions instantly whenever you make a transaction. 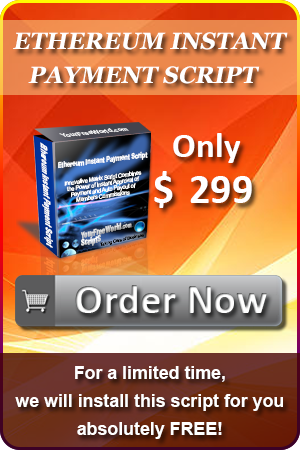 There is no need to payout manually to admins or members because this script does it for you and saves you the hassle. As with all our other scripts, we will be updating this script with more powerful features so you can take your business to the next level. So, what are you waiting for? ORDER YOURS NOW! The features of this script are the best-in-class where some of those are described henceforth. Let’s have a look. Offers the feasibility to set up 4 admin fee with 4 different Ethereum wallet address. Supports unlimited payment levels with the default setup of Ethereum wallet address through the admin in case the sponsor or upline is not present at that level. Ethereum Auto Approval Process to enable auto verification of all payments.